Antioxidants are ingredients that intercept problems existing in the environment and then, through a complex process, lessen their visible impact on skin. There’s no shortage of antioxidants available—most of them occur in fruits and vegetables, others are made in a lab (something we call "designer antioxidants"). Both types offer benefits to all skin types, all ages—and you can’t start using them too soon! For a bit more detail, skin care products often contain plant extracts for their antioxidant kick, but even better for skin is the isolated antioxidant component itself. This can also be derived or extracted from the plant leaf, stem, or root and added to a skin care product, making the antioxidant delivery to the skin more potent. The list of exceptionally helpful antioxidants we use in Paula’s Choice Skincare products is long, but to name just a few: vitamins A, C, and E, green tea extract, soy extract, pomegranate extract, turmeric, and grape extract. We also use concentrated antioxidants with names that are not easy to understand (but they’re brilliant for skin nonetheless); a few examples are superoxide dismutase, ascorbyl glucoside, resveratrol, epigallocatechin-3 gallate, and astaxanthin. To understand how antioxidants work and how they help skin, it’s important to know that one of the biggest headaches for skin is the steady ravaging it gets from environmental exposure. This daily assault creates a cascade of unseen events that’s damaging and harmful to skin, especially unprotected sun exposure! It’s intriguing to point out that these negative consequences can also be caused by using skin care products containing abrasive or sensitizing ingredients. In the short term and long term, this impact leads to signs of aging such as sagging skin, the appearance of wrinkles, uneven skin tone, dull skin, dryness, sensitivity, redness, and a whole host of problems no one wants to deal with. But unless you take some action, skin’s natural defenses will continue to be beaten down, and you won’t like what you see in the mirror! Antioxidants step up to do their job helping to defend skin from environmental assault. 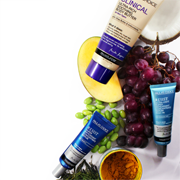 Antioxidants stabilize and help to impede the environment’s ability to wreak havoc on skin. Antioxidants also have soothing and calming qualities for skin. They work on so many aspects of skin’s vitality and appearance, it’s really stunning what they can accomplish when routinely applied to skin. Thousands of studies have clearly shown how antioxidants can help to renew, restore, revitalize, and rejuvenate skin in significant ways. And it’s never too late to start using antioxidants in your skin care routine. Not only will you begin to see a remarkable improvement in your skin almost from the beginning, but the long term results will continue to impress. Antioxidants are not only about their amazing benefit for you now, but for the rest of your life. Whether it’s a toner, serum, targeted solution, or moisturizer, they should be filled to the brim with antioxidants. In the search for great products, seeing beneficial ingredients on the label is a big step towards finding the right product for you. However, just as important as the antioxidants is the container itself! The wrong packaging means your won’t be gaining the most from antioxidants! Despite their powerhouse abilities, antioxidants are delicate and must be packaged in containers that will ensure they remain effective, or else your skin won’t get their full benefit. As part of how they work to help your skin, antioxidants break down in the presence of light and air. So, if an antioxidant-rich moisturizer, serum treatment, or other product is packaged in a jar or in clear packaging, it will likely lose its antioxidant benefit within a few weeks (or even days). How long this takes to occur depends on the formulation, but breakdown they will. Any skin care products with antioxidants you use should be packaged in containers that are either airtight or air-restrictive and keep your fingers out of the product (putting fingers inside a jar steadily contaminates the contents and further breaks down the beneficial ingredients).